No this is not the Fox Sci-Fi drama starring Michael Ealy and Karl Urban. It is however a low budget 80s style throwback horror flick that is deliberately reminiscent in credits, style, pacing and formatting of such iconic 70s and 80s films as Evil Dead, Re-Animator, They Came from Within and Halloween. It's a film with plenty of graphic bloody violence including an attempted(?) sexual assault. So if that sort of thing doesn't meet your criteria you know what to do. This is definitely not something that should be watched by people who are only familiar with the shallow end of the horror pool. Nope this film is made for folks who can dive and swim in the deep end. It has a short running time (80 minutes) and leaves a lot of questions unanswered, which for this movie works well. There are a few people who do stupid things, particularly near the ending, but at least some of this is called out in the film itself. The acting is not super convincing, which is occasionally a serious problem, but by genre standards it's not the worst I've ever seen. Some of the lead actors actually also worked on editing and other behind the scenes tasks. I guess that saved money. The film is set in the 80s. The producer(s) and director did an admirable job in ensuring that sets (mostly rotary phones thank you very much) and automobiles were of a piece with decades gone by. 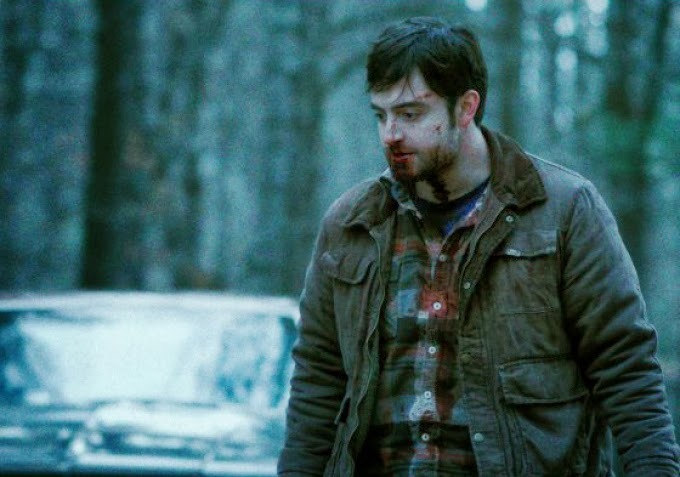 Almost Human is set in Maine. There's a blink and you'll miss it shout out to Stephen King. The photography/cinematography is not what I would call crystal clear. Even on a HDTV the film remains rather blurry and in some scenes appallingly so. That could have been a deliberate attempt to put viewers in mind of the aforementioned classics or it could have just been a byproduct of not having the best equipment. Either way I think you ought to take the time to put your best foot forward technically. I don't think this film always did that. So shame on the creators for not doing so. If money was saved on the acting it wasn't immediately apparent that it was being spent on photography and SFX. 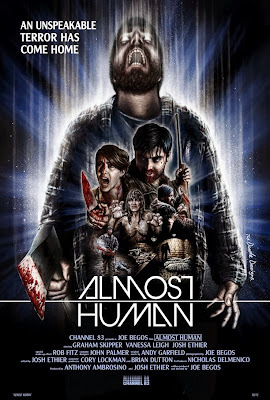 Nevertheless, regardless of its quirks and shortcomings this film still has a certain energy and drive that perhaps could and should have been more adequately expressed with a slightly higher budget and a "name" actor or two. But what the heck, we all have to start somewhere. And there's always going to be room in the world for low budget horror films. Under the right circumstances this could be a cult hit. I don't know what those circumstances might be but life is strange, you know? One day you're on the bottom. Two decades later work like this is being revered as ahead of its time and something that was woefully under appreciated in its day. Ok, all that said what's this film about? Quite simple. Two years prior, a frightened Seth (Graham Skipper) is driving like a madman to his friend Mark's (Josh Ethier) home. IIRC it's left unexplained why Seth was going to his buddy's home in the middle of the night in the first place. Heck my family and friends generally know not to even call me past 8-9 PM unless there's an emergency but that's not important right now. What is important is that Seth has a harrowing story to tell about bright lights, nose bleeds, high frequency sounds and alien abductions. To hear Seth tell it, one of their mutual friends was kidnapped by aliens, right out of the truck. Mark, a much burlier and more aggressive man than the slight Seth, doesn't believe this. And Mark doesn't like the semi-hysterical Seth scaring Mark's girlfriend Jen (Vanessa Leigh). Although Seth thinks he was followed he-man Mark scornfully dismisses this and marches outside where amid blue lights and high pitched noises he promptly disappears. Mark is brawny but evidently not too brainy. Two years pass. Seth escaped being charged with Mark's kidnapping by the narrowest of margins. Most people still think Seth knows more than he's telling and shun him. Seth can't remember much and Jen can't remember anything. Jen has married/moved in with another man and doesn't count Seth among her circle of friends any more. When she looks at him you can almost see her brain trying to determine whether Seth is just a LOSER or instead a LOONY BIRD. Either way she would prefer not to be around him. Seth is a slacker at a hardware store. He routinely gets in late, is often sick, and just mopes around. Nevertheless he's starting to remember more of what went down that night two years back. And he's having nosebleeds again. Something's indeed happening, as Seth tries to tell Jen. Unknown to either Seth or Jen. Mark has just returned to this world. Or to be accurate, what's returned is mostly something that is wearing Mark's body. And it wants to reproduce. It can do that in a lot of different ways, as we see. But the remaining Mark portion would very strongly prefer to reproduce with Jen. Her willingness is preferred but not strictly speaking necessary. Carnage ensues as what could have been a true alien invasion story somewhat morphs into a slasher movie. A huge guy with an axe/chainsaw/shotgun/big hands goes on a killing spree. A parasite is a strange being. Usually it doesn't intend to kill its host but attempts to live in a symbiosis. Depending on its needs it might occasionally influence the host to behave in ways that are not necessarily good for the host, but are required for the survival of the parasite. Sometimes of course the parasite's survival or reproduction may require the death of the host. And then you have the cuckoo bird, which often lays its eggs in other birds' nest. The cuckoo baby upon hatching, destroys the eggs of its host and may even kill its host's children, therefore monopolizing the resources of its "parents". This is known as brood parasitism. This is where the word cuckold comes from. 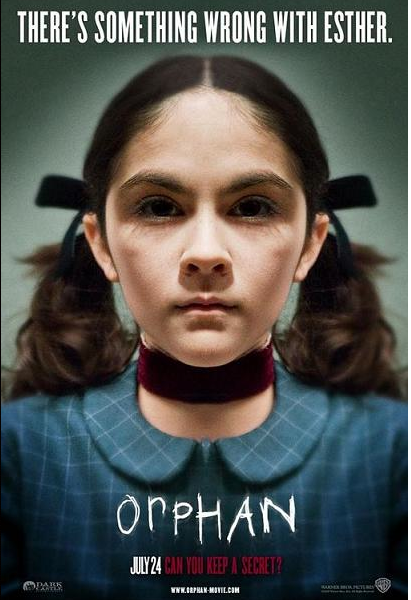 Those sorts of thoughts were all brought to mind re-watching Orphan. Other thoughts that came up included how vulnerable we all are to our intimates. I mean if someone in your house goes bad, there's a pretty good chance your guard will be down in a way that would never occur outside the house. Trust is key to maintaining romantic or familial relationships. I thought I had reviewed this 2009 thriller before but a quick search didn't reveal anything. Hmm. So if I did review this film before, my apologies. The local Blockbuster is closing down. As I thought this film worth having permanently, I picked up the DVD for cheap 5 weeks back. I'm generally a Farmiga fan so I decided I'd write something short about this movie here. I thought this was a pretty good thriller. It has a few plot devices of course but nothing which I found outrageous. The director would go on to helm Unknown with Liam Neeson. 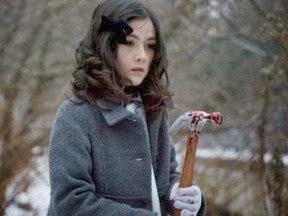 I won't say whether Orphan has any supernatural aspects. It is one of those old school thrillers that can manage to get scares out of something as prosaic as a orphaned child offhandedly showing that she's a skilled concert pianist. 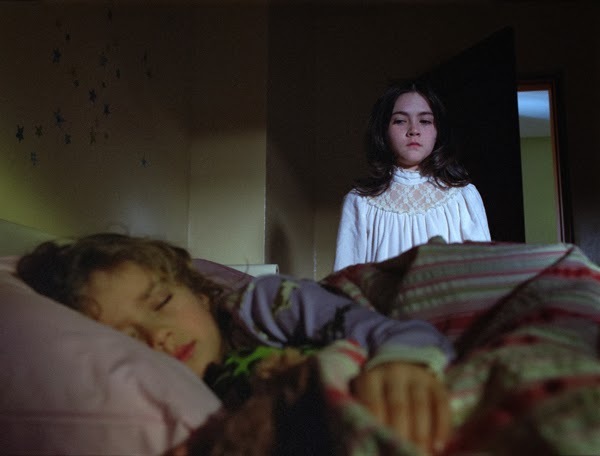 I kept expecting Mrs. Blaylock from The Omen to show up and tell the little girl to "Have no fear little one. I am here to protect thee." Orphan is not the sort of movie that would make you welcome unknown children into your life. You won't want to give this kid a pinch on the cheek and take her home. Like the film We need to talk about Kevin, Orphan asks you what would you do if a child of yours was simply no damn good and/or downright dangerous? Like that film, but in a much more extreme fashion Orphan engages in or should I write indulges in some serious psychosexual drama. In both cases it's the mother who sees the danger most clearly while the husband/father thinks that his wife is losing her marbles. In Orphan this might as well come with big red signs indicating FREUDIAN DRAMA RIGHT HERE! YMMV on this. There is a rather significant item revealed about 2/3rds of the way thru the film. It may change how you see things. Some people thought it was lazy writing or was designed to save the film from some rather truly unfortunate implications. Some of the disturbing elements come out of left field at the viewer. John Coleman (Peter Sarsgaard) is an architect. His wife Kate (Vera Farmiga) is a musician/music professor. They have two children, a son Danny (Jimmy Bennett) and a daughter Max (Aryana Engineer). Although the family is financially successful with a huge home and lands that just barely miss the size cutoff to be called an estate, like most families they have problems beneath the surface. Max is deaf/mute. Danny is something of a jerk. Kate is a recovering alcoholic. The couple recently lost a stillborn child, a daughter. Deep down inside Kate worries that John might blame her for this loss. She still grieves for the child. And John, well, let's just say he's not averse to playing house with other women. So, hoping to recover from the stillbirth, John and Kate visit a Catholic orphanage and adopt a nine year old girl from the former USSR. This girl is named Esther (Isabelle Fuhrman) Esther is unusual on at least two levels. It's not just that Esther always dresses in very formal, even archaic wear and is never seen without her high/frilly collars or chokers covering her wrists and neck. It's that Esther is far more self-assured, confident and sexually aware than a nine year old girl should be. When the couple accidentally allows Esther to become aware of some of their intimate activities, Kate haltingly tries to explain to her adopted daughter that married Mommies and Daddies who love each other very much sometimes like to spend time together in a beautiful and natural way which is totally private. Esther dismissively replies "Oh you mean you were f*****g." and goes about her business. Kate starts to take a dislike to Esther. When a schoolgirl bully who insulted Esther meets with a nasty accident, Kate goes back to the orphanage to check on Esther's background with the head nun Sister Abigail (CCH Pounder). The nun is torn between her professional desire to place this orphan and her personal dislike for the little girl. Sister Abigail tells Kate that accidents happen to people who get on Esther's bad side. Meanwhile, Esther is bullying Danny and Max. Max is under Esther's spell while Danny is too frightened to say anything. But John likes Esther, who gives every indication that she's very happy to have a Daddy. And John doesn't care to listen much to what he's starting to think of as the paranoid ramblings of his drunk and needlessly jealous wife. John is not bright. Although the overlong ending is utterly cliche driven the beginning and middle are interesting and full of ominous build ups. When either spouse is caught doing something wrong by their partner they often return fire by criticizing something else their accuser did years before. Kate doesn't mind reminding John of his infidelity. John is not above measuring the liquid level in whiskey bottles and looking questioningly at Kate. 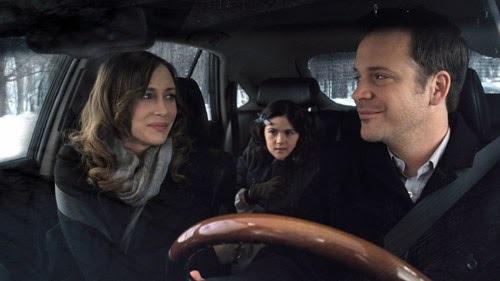 Farmiga and Fuhrman have the meatiest roles. Fuhrman's character is sporadically sympathetic but mostly suitably creepy. Farmiga's character gets to have more range. She does motherly protectiveness and pugnaciousness quite well. That is, once her character stops whining.